Several initiatives are in store next year for the grouping of emerging economies, which continue to expand ties, even as Western analysts write them off. The BRICS grouping of emerging countries (Brazil, Russia, India, China, and South Africa) plan to adopt a new strategy in 2014 aimed at expanding economic cooperation. The geopolitical opponents of the BRICS Group of countries continue their non-stop attempts to “bury” the alliance, saying that it will inevitably fall to pieces because of the differences existing within the organization's framework. 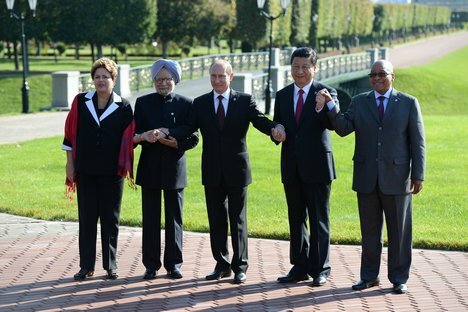 However, the BRICS countries are pinning great hopes on their partnership. Today the BRICS Group is an influential international association. Together, the five countries account for 43 percent of the world's population and for more than one fourth of the global economy. The Gross Domestic Product (GDP) of the BRICS countries is growing faster than that of the Western states. After these figures were released, both European and American analysts started saying that the BRICS Group is an artificial union, which will become non-existent soon due to the differences existing between its members. Meanwhile, at the session of the BRICS Analytical Council earlier this year the BRICS members decided to set up a development bank and to create a database to be able to exchange economic information as well as all other types of information. Many experts say that a new financial body will serve as a counterbalance to structures staying under the influence of the West – such as the International Monetary Fund (IMF) and the World Bank (WB). Next year the BRICS member-states will have to resolve a number of issues dealing with the customs rules and to eliminate the difference in the main GDP coefficients of the member states. Although the BRICS countries continue to pattern their behavior on their foreign partners, interaction within the grouping’s framework is actively gaining speed. Altogether, more than 20 formats of cooperation, including the summits of the BRICS heads of state and an expert dialogue, are currently operational within the BRICS framework.